Tom Blount, UWSP, with Liam McGurk, Head Red. You may think having a satisfied client would be enough from a project but the design for the Science Park not only impressed the client but also produced further benefits since HeadRed have acquired work from several new clients due to the relationship. 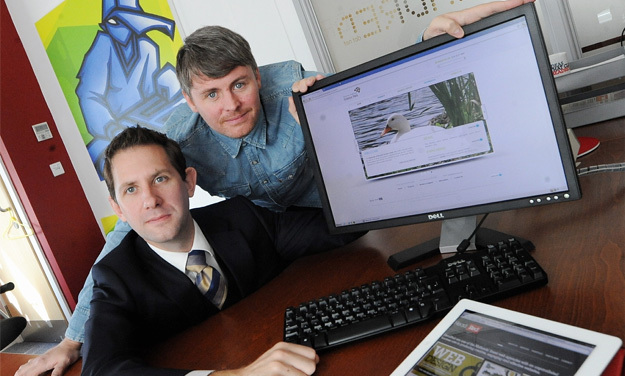 Our director, Liam McGurk, said that being given the job of redesigning University of Warwick Science Park’s website has proven “to be an extremely fruitful relationship for us” and based on this work we are now providing other companies with some of the “wide range of services we provide such as search engine optimisation, web design and development, ecommerce, corporate branding and graphic design.” About the extra work commissioned by other clients because of this job, Tom said that it is “great news that they have been able to pick up additional business and provide some of our clients with valuable services.” Following the success of both the University of Warwick Science Park redesign and the work undertaken for the other clients landed due to that redesign, HeadRed have now expanded their SEO team so that they can continue offering quality products and services to both their current client base and also new clients.